After yesterday's lengthy walk up The Manods and on to Moel Penamnen I had the idea that today's short 4 mile walk might be an easy day, giving me the chance to recover and manage more than three consecutive walking days after tomorrows walk up Moel Hebog. are no mountains adjacent to the NW and it was very murky when I went up the two ranges to the east; Moelwyns Mawr/Bach & The Ysgafell Wens hence have not seen this ridge before. I was therefore chuffed as nuts driving towards Croesor when I spotted the conical shape of The Cnicht ahead, commonly known as The Matterhorn of Wales. Approaching the North Top first from Cwm Creosor, more of a slog, in the best possible way, rather than difficult. Took 2 hours to walk from Croesor to do 2 miles with over 500m of ascent. 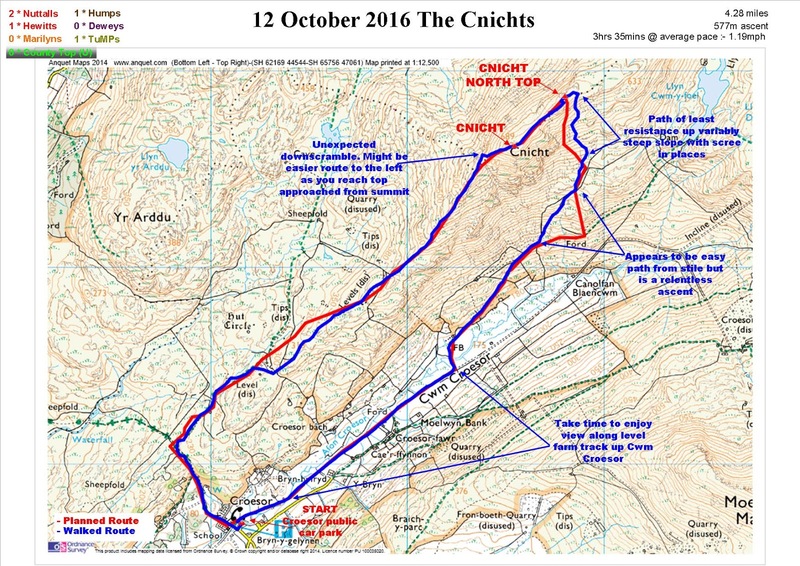 Descent of The Cnicht was more difficult with a testing down scramble in one spot. Not quite the easy day I was expecting but what a pleasant surprise. This is one of the few hills I would like to return and visit from an alternative route.